The beautiful city of Larnaca is found on the southern coast of Cyprus and is famous for its palm tree seafront. It has evidence of settlement from 1300 B.C. With such an enormous history, there are a lot of cultural traditions to draw from. Take a break from the beach and shopping to be entertained at one of the traditional Cypriot events. Here are some of the most significant cultural events held in Larnaca each year. I’ve placed them in order of date. Hala Sultan Tekke sits on the shore of Larnaca Salt Lake.Green Monday is a picnic event featuring traditional Greek music, songs, games, and competitions. Organized by Athanasia, a cultural organization, Green Monday is held at the start of Lent. 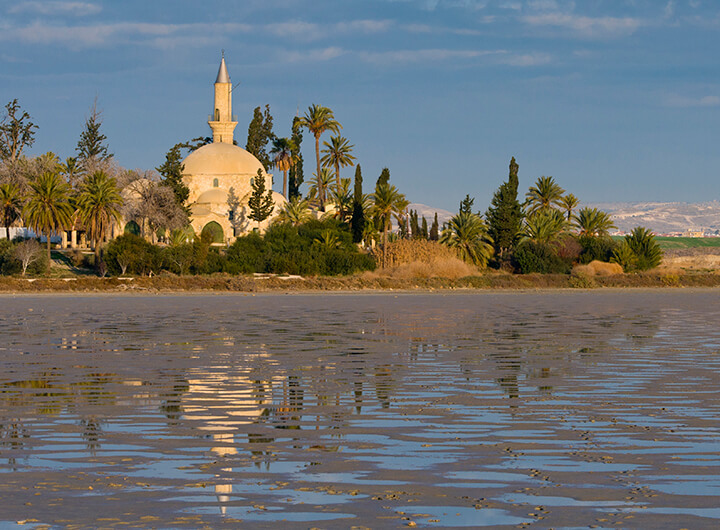 This event takes place at the Hala Sultan Tekke shrine on the shores of the Larnaca Salt Lake. Begun in 1988 and held every April, the Larnaca Festival of Classical Music is put on by the Larnaca Municipality. The festival has grown from its beginnings as a student recital into a multiple day occasion featuring influential composers and orchestras. Performances are held at the Larnaca Municipal Theater. 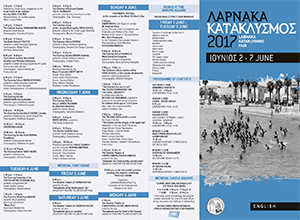 For 2018 festival times, please call either: +357 24 657 745, +357 24 629 33 or visit the Larnaka Municipality website (English Version). The Kataklysmos festival continues an ancient Greek tradition that is celebrated at the Finikoudes seafront promenade in Larnaka every year. The festival is held 50 days after Orthodox Easter. This event, which means Cataclysm celebrates the salvation of Noah from the biblical flood. There are all kinds of water-related activities happening during the day and a concert and market bazaar at night. The Larnaka Municipality organizes the weeklong festival each year which receives over 300,000 visitors. For a sample of the events, please click the link below for the 2017 program guide. Started in 1997, this musical event allows you to experience Byzantine ecclesiastical music and choirs from Cyprus and beyond. This event is held during Easter week and is organized by the Larnaca Municipality. Byzantine Days takes place at Agios Lazaros church and Larnaca Municipal Theater. For more information call +357 24 657 745. Held on May 9th, Europe Day celebrates the founding of the European Union. There are different festivities around the city that day, but most of the fun will happen at the Finikoudes seafront. Larnaca Medieval FortressIn July residents and visitors to Larnaca are entertained at the Larnaca Summer Festival organized by the Municipality of Larnaca. It is a festival of music and performing arts. Performances by Cypriot and International artists cover theater, dance, and music. Also, there are screenings of movies and poetry recitals. Concerts take place at the Pattichion Municipal Amphitheater, and other events are held in the courtyard of the Larnaca medieval fort. This event, held in November at the Larnaca Municipal Theater, allows you to enjoy local amateur performance artists. The festival program includes performances of theatrical groups, choirs, orchestras, and dancers. Every winter the Larnaca Municipality organizes a group of events called the European Cultural Winter. Performances cover ballet, classical music, jazz ensembles, and music from films. For more information contact the Larnaca Municipal Theatre at +357 24 657 745.